Admit it. 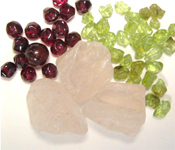 You’re interested in the healing properties of semiprecious stones. You may think the notion is a known fact or a bunch of garbage, but when someone mentions it, you either *** your ears or raise your hackles. My opinion is this: When I go to a bead show and run my hands through piles of stone strands, I linger just a little longer than I usually do. You know, like when you’re wearing a really soft sweater and someone pats your shoulder for a millisecond longer than they normally would? That’s my reality with stones. There’s something there, but I’m not really in touch with it. Paging through Designing Jewelry with Semiprecious Beads inspired me to haul out my semiprecious stone bead stash to explore them in a concentrated way (versus my usual scramble through the stash, fueled by fragmented thoughts like “Red. Need Red Bead. Round. 6mm.”). It’s strange, but taking the time to do this actually floored me. I was struck by the variation and versatility of these little gems dug right out of the ground. What we have at our fingertips isn’t just a bunch of rubble Fred used to bring home to Wilma after a day at the quarry. What we have now makes up a painter’s palette in different hues and shades. A candy store of different opacities and refraction. A miniature modern art gallery of shape, form, and finish. Once I pulled myself away from those “all the pretty colors” daydreams, my left brain kicked in. First I arranged the stones in small groups with their color families so they could work as points on a color wheel. 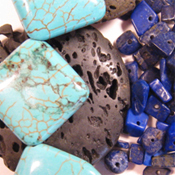 Turquoise (communication), lava (mental and physical strength for battle), and lapis (knowledge and wisdom). 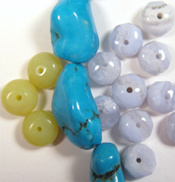 Jade (calming), howlite (patience), and blue lace agate (lessens anger). Do you have a stone combination with a purpose or have you made a piece of semiprecious jewelry with healing in mind? Please share what you’ve come up with on the website! 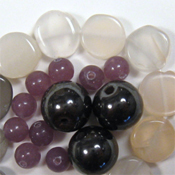 Coming Friday: a new Beading Daily design challenge with semiprecious beads! I love semi precious stones and have been working on a small jewelry business off and on for years. I am not a learnt professional,however, i go with my gut a lot of the time when working with semi precious stones. At first i would only use one type of stone . Lately ,i have been feeling like i need to amplify my pieces. My latest piece was a purple jasper,amethyst,rose quarts,clear quarts with hints of howilite. Wow i definitly feel super in tune with myself.And i have been communicating so much better with my partner and children. I am becoming firm yet still very loving. Funny that ever since then i have started combining now. I would just caution to beginners of wearing semi precious stones, start off with one. And always look up each stone, if the different stones have similar purposes or complimentary ones then it may work amazingly. When your spirits are up anything is possible it feels like. I am not an expert ,however , i have seen in a lot of cases its ok. Again u have to make sure that the energies will not cancel each other out. if you have howilite then do not put it with a stone that may cancel out the calmness of your howilite .